Spring time on the Columbia River can a great way to get the Salmon season started. Catching the most sought after salmon in the world can be a great feeling. Spring Chinook fishing on the Columbia River can be a great to start off the season with the most delicious table fish there is if you like to eat Salmon. The high fat content of the Columbia River Spring Chinook with its high omega 3 vitamins makes this tasty treat a great healthy meal. In early March on the Columbia River and Willamette River, near a major metropolitan city of Portland Oregon is where Spring Chinook can be targeted. The season can last until early to mid April. Although catch rates are not high, the catch is very gratifying. Early June is a fantastic time to get to the beach and get after some lights out Chinook fishing in the Pacific Ocean. On good projected returns of Salmon, the ocean will open for Chinook Salmon retention. This is know as the JUNE HOG FISHERY out of the mouth of the Columbia River. I've seen fishing as good as it gets this time of year. 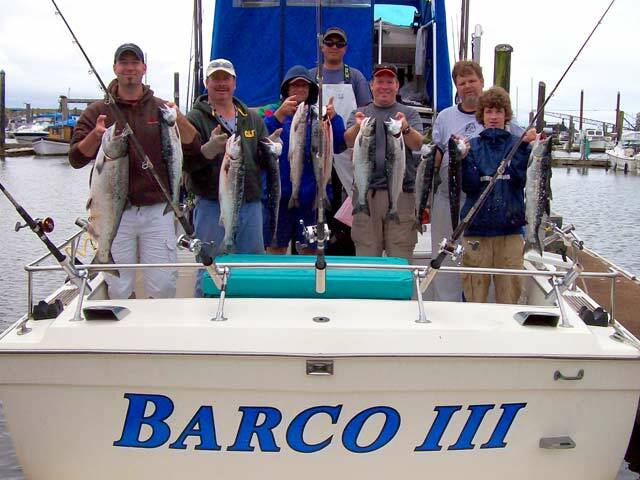 Limits of 15lb to 49lb Chinook Salmon, or "KINGS" are easily achieved. There is a small quota which has been reached at times. Departure times may vary from the Port of Hammond due to tides that will determine when we leave the dock. Nearby Warrenton and historical Astoria have plenty of sites and museums to go through and look at. 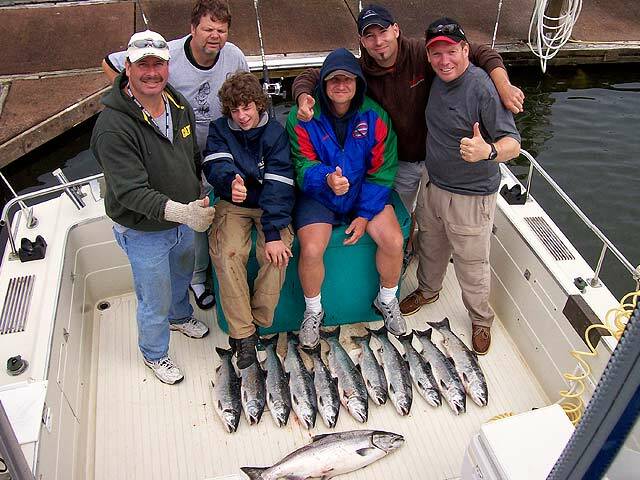 As we get through our JUNE HOG FISHERY, the season in the Pacific Ocean opens up to the Coho or "SILVER" Salmon. Typically the bag limit is 2 Salmon. 1 Chinook and 1 Coho, or 2 Coho. the Coho is a smaller Salmon, but is an acrobat. This Salmon will jump and run which makes it a fun fish to catch. Quit often in a good Coho bite, we may have multiple salmon on at once. The ocean season can last through August if quotas last that long. Once August hits the lower Columbia River, the famous BUOY 10 FISHERY begins. This is where hundreds of thousands of KINGS and SILVERS return to make there journey back up the Mighty Columbia River. The Astoria, Warrenton, Hammond, Chinook, and Ilwaco ports are full of eager fisherman to capitalize on this world class fishery. These Salmon will move in and out with the tide for almost a month before they head upstream. This gives anglers a great chance to load their freezers up with some excellent Salmon. 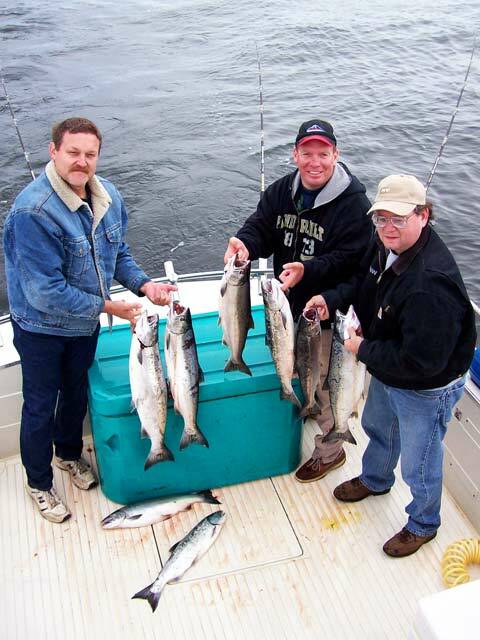 If you get the opportunity to come to the lower Columbia River, don't miss out on this fishery. There are plenty of days to get after the Salmon in the Columbia River and Pacific Ocean. Just call and book your trip.